Last week I talked about “cheap” and “inexpensive”. You learned how they’re different and how to use them differently. 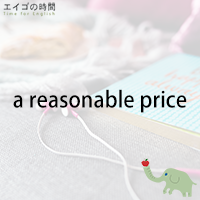 Today I’m going to give you another cost-related word or adjective which is “reasonable”. When you say the price is “reasonable”, you mean it’s fair and not too high. It’s an acceptable price. For example, you bought a laptop for business use. You paid 100,000 yen for it. You could have gotten a pretty good laptop for 60,000 or 70,000 yen. But when you took into account the CPU, hard drive capacity, screen resolution, different applications, plus call center assistance coming with the product, you were convinced 100,000 yen was a fair deal. The price was reasonable. Now, let me give you a quiz here. Please listen carefully and choose the one that is TRUE. Ready?